Deleting a page permanently removes it from the site map. All associated designs, documentation, discussion topics, and annotations are also deleted. A deleted page cannot be recovered. Therefore, you should be confident that you won’t lose important information. If you want to hide a page from Reviewers, you can change its visibility instead. 2. Select the page to be deleted. 3. Place the page in the Trash node. 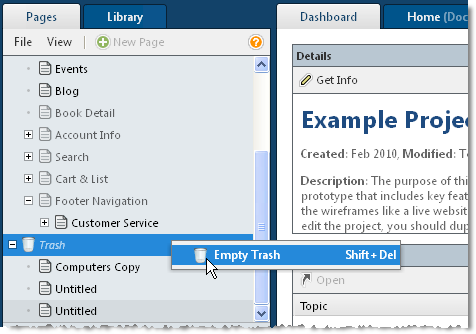 Place the page into Trash node by dragging it, selecting Move to Trash from the File menu or from the right-click context menu, or by using the keyboard shortcut. All subpages are also placed in Trash. To restore trashed pages, drag them from the Trash node back to the site map. Select the Trash node, right click, and select Empty Trash. All trashed pages are permanently deleted. The Trash node is shown below.